One of the best parts about being able to sew and making time for it nearly every day is seeing people use the things I make! As many of you know, my younger sister (who I'm very close with) recently started her first year of college several hundred miles away. As a result, we won't see her until her winter break mid-December (not even for Thanksgiving... sniff). Anyway, I had been thinking about making her something for her dorm room since she graduated in June, but she already has so many quilted things (lol oops). Finally, my lovely guild friend Lori (@gratitudequilts) revealed her tradition of making a pillowcase for students going off to college. That was perfect! I grudgingly dragged out my yard of purple "Floral Burst in Purple" Biology fabric by Sarah Watson for Cloud 9 Fabrics (grudgingly because it's one of my favorites right now and I knew she would adore it), plus some Alison Glass feathers and a light purple solid, and got to work using this tutorial from The Cottage Mama. Thanks Lori! I'm lucky to have a friend like you. I'm about to start on her next mini quilt for her birthday in November, based on this picture. Tee hee. I'm so excited! Linking up to Fabric Tuesday, Needle and Thread Thursday. 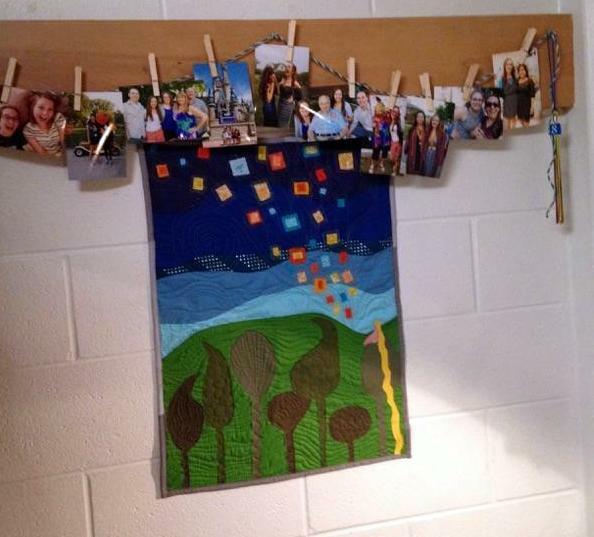 Oh my gosh, the Tangled mini quilt you made for your sister is just beautiful! I love it. Lucky for me, my sister is totally craft-worthy too. It's so much fun to quilt for her! 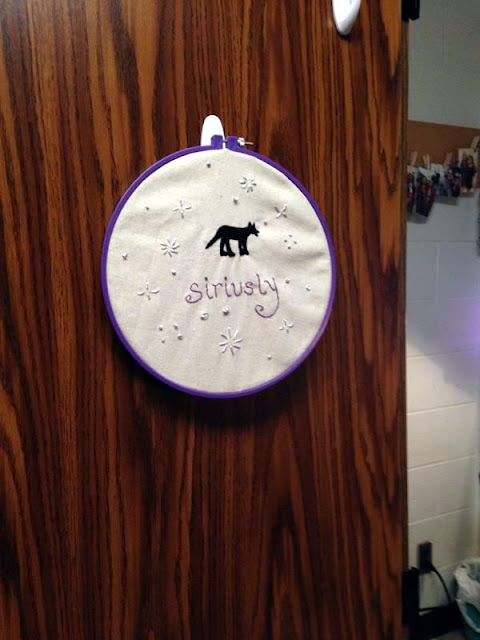 I love the siriously embroidery, that really speaks to my inner geek. I love how much you two love on each other and how beautifully decorated her dorm room is! Great idea for gift, I never tried french seams. But I will. I'm making my daughter U of L pajamas for Christmas and the pillow is now going with them and maybe a small surprise inside the pillow. Thanks. 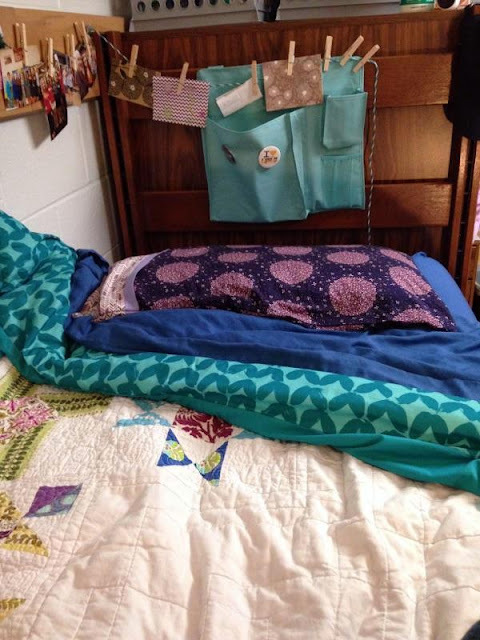 I love making and gifting pillowcases. Love making Pillowcase of the Month and Holiday pillowcases. What a timely post! I love pillowcases as gifts. I'm lucky enough to be going on an overnighter with my niece, her mother, grandmother, and my niece's special friend. 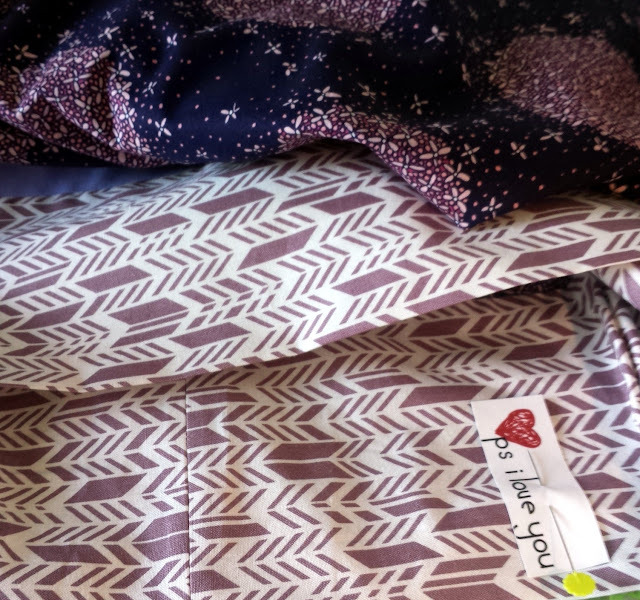 Right now I'm making pillowcases for each of us--it started out as keepsakes for the girls, and then I kept finding special fabric for each of the older "girls" and thinking, "Oh, I should make her a pillowcase, too!". Truly, though, pillowcases are so comforting. Decades ago, when I was a terrible seamstress, I made pillowcases for another set of nieces at Christmastime, and I still see those raggedy old things on their pillows and I understand why: because they know how much love went into every uneven stitch, and it reminds them of the old days, which is really the point, right? Marisa will get the point, too, as her dorm room already shows. So much love. I like the new closeup picture of yourself! It captures your spirit beautifully. Pillow cases are such a great present! They are simple and add so much color and warmth to a bed. I love the labels! Also, I love that movie (and book)...or really anything with Gerard Butler, amirite? Phantom of the Opera?! Swooooon. Anyway. 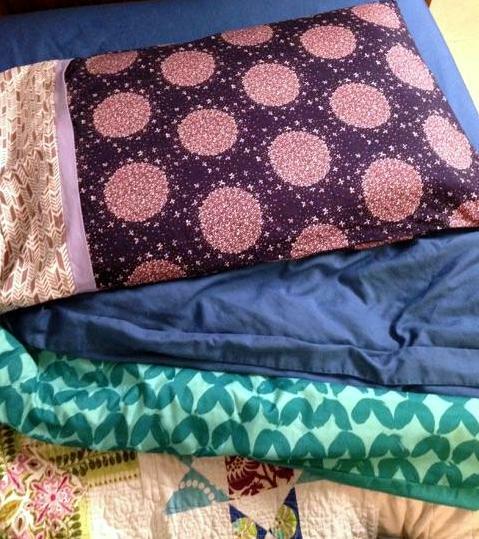 So looking forward to the mini quilt you will be making next! What a great picture to base it off of!